Like many cultures with a strong national food culture, Athens has been slow to welcome foreign cuisines. First, there were the heady 1990s, when the first luxurious restaurants serving such food opened. That was followed by a decade of discovery, with the first mid-priced sushi and Indian restaurants appearing left, right and center. An enormous influx of immigrants from Pakistan, Bangladesh, Afghanistan and North Africa from the mid-2000s onwards brought pockets of Middle Eastern grocery stores and eateries to downtown Athens, Kypseli and Patisia. 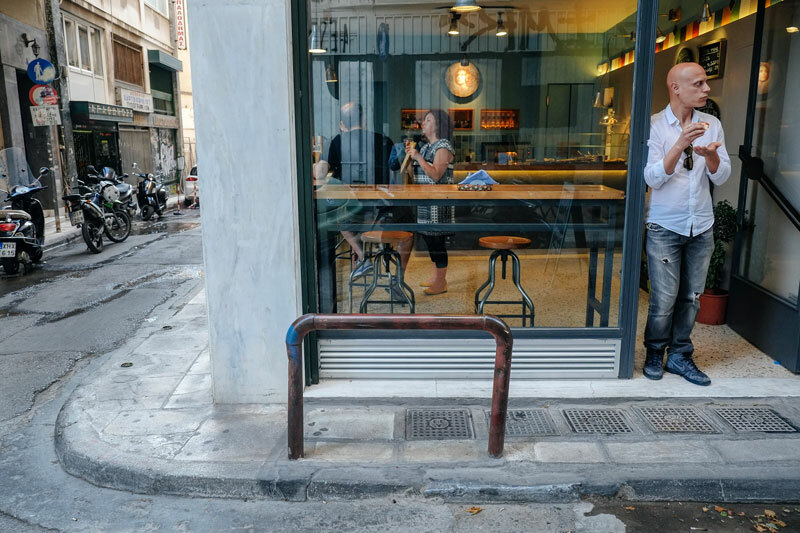 Just a few years ago, Athens’ Middle Eastern food scene was divided in two, with various mid-priced to expensive restaurants catering to Greeks and the Kurdish, Syrian, Iraqi and Afghani immigrants making delicious street food for their own communities (and a few adventurous Athenians). Things changed when street food mania gripped most of the Western capitals. As usual, Athens had to follow suit, and that’s how lahmacun and falafel made it into the mainstream here. About a year ago, Falafellas opened on a busy stretch of Aiolou, a pedestrian-only street whose many new cafés and restaurants have made it an extremely fashionable destination. The hole in the wall is painted pistachio green with a striped awning that screams “hipster.” The menu is very brief, offering tabbouleh and hummus salads and falafel in two portion sizes. For the last, ground chickpeas and herbs are formed into patties and fried, then served with tahini, lettuce, tomato, yogurt sauce and eggplant in a thin pita. To say that Greeks do not like queuing would be an understatement; we positively loathe it. Yet customers sit patiently in a queue for half an hour or more to eat falafel. 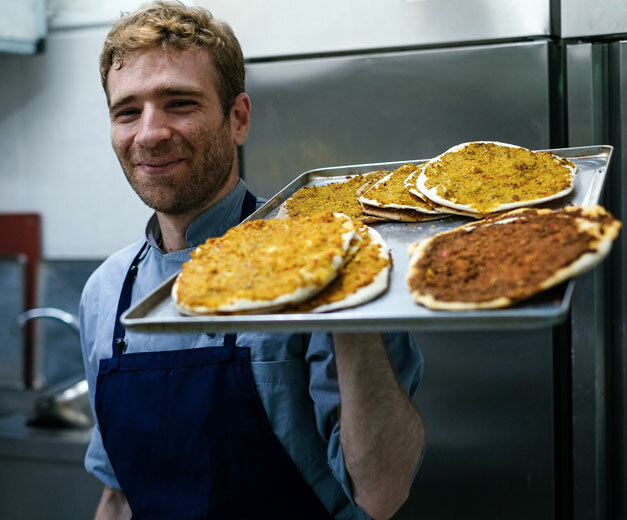 The owners, a former photographer and a former auto mechanic, had tried falafel while traveling abroad and had recognized the economic potential of bringing it to Athens – and clearly they had the right idea. While we think Falafellas makes a pretty good chickpea patty, it’s the new kid on the block (just around the corner, actually) that really knocks our socks off. Feyrouz was recently opened by a family with roots in Antakya, the Turkish city that borders Syria. The room has a clean, airy feel to it, and a portrait of Feyrouz watches over all the proceedings. The eatery specializes in lahmacun, the thin, round flatbread topped with spiced ground meat and vegetables – a kind of Middle Eastern version of pizza. 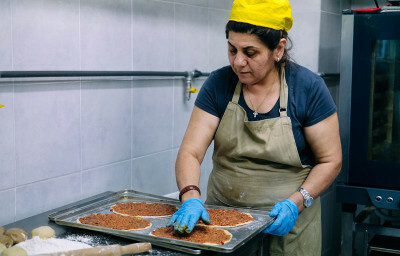 Feyrouz offers white or whole-wheat crust and beef or vegetarian toppings. After you’ve chosen your topping, you can add your hummus, yogurt, a spicy tomato sauce and/or different types of fresh greens. Our vegetarian version with tabbouleh, yogurt and salad was impressively good, both spicy and fresh. Feyrouz also serves an excellent peinirli. We have written previously about this boat-shaped bread with Black Sea origins, but with a few exceptions there were very few places that served a credible version – homemade and not super-greasy – in downtown Athens. But here it is, at last! Feyrouz makes peinirli with soutzouki (spicy beef sausage) and pastourma(an Armenian delicacy made of air-dried camel or beef), as well as a vegetarian one with tomato, cheese and olives. Both Feyrouz and Falafellas are a sign of things to come. And the usually reluctant Athenians are showing an increased interest in trying something new. That’s the kind of globalization we can get behind.